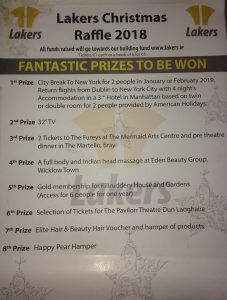 Lakers Christmas Raffle tickets are now available, we have some amazing prizes this year, check out the list in the image below. Tickets are €1 each or a book of 6 €5, if you would like to sell some books to your friends and family and raise vital funds for Lakers members, please contact the office on 01-2022694. The draw will take place on Tuesday the 18th December at 12pm.